April 11, 2019 - by Ilda - 14 Comments. Current Philippine Vice President Leni Robredo has become the country’s laughingstock. Her statements turn into memes and get mocked for being pointless. Frankly, most members of the Liberal Party have become laughingstocks too, but since Robredo issues more statements compared to her party mates, she is the default spokesperson for the Opposition and therefore, their moronic representative. Robredo quite often issues statements that make you want to scratch your head. A lot of people are left asking “What the hell does she mean”? She just doesn’t make any sense. Her statements aren’t even worth interpreting. The problem starts with her preference for speaking in Tagalog, then she makes it worse when she beats around the bush, acts coy or tries to appear modest. Her speaking in Tagalog is a lame attempt to come across as pro-poor. It simply isn’t working. Most of us can see through her act because while she acts demure and timid, she is far from being a modest person. Her public relations team humblebrags about her travels abroad with her entourage on social media. There is even a photo of her that went viral just before the elections showing her waiting for a bus, implying that she is just a regular gal using public transport. 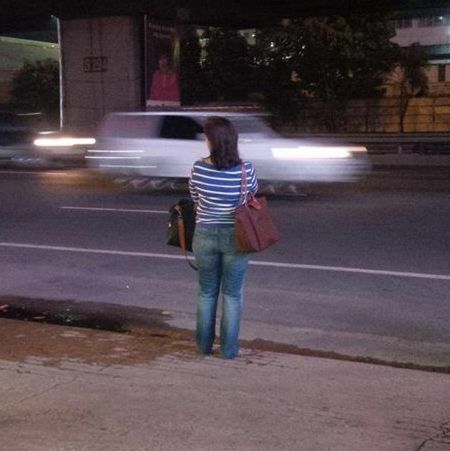 Netizens were quick to note that it was quite convenient that someone took a photo of her late at night and that she was waiting where there seemed to be no bus stop around. She can’t wait to replace President Rodrigo Duterte. She actually thinks she can do a better job as the country’s commander-in-chief. What a joke! It really isn’t a good idea to be waiting for a bus where there is no bus stop. Robredo has been blatantly undermining Duterte’s policies since Day One. While she says she is willing to work with Duterte, she contradicts herself when she questions his policies before the media instead of talking to him directly about her concerns. Duterte was willing to give her a chance by including her in his cabinet in the beginning, but her incessant attacks against him only worked against her. She has not won back Duterte’s trust after being fired as the chairperson for the Housing and urban Development Coordinating Council in just a few months on the job. Robredo is simply not a natural diplomat. She’s only good at dressing up and showing up for ceremonial functions like yearly commemorations, which her supporters laud her for. They are that shallow. The thought of Robredo replacing Duterte is a real worry. Robredo will be worse than the late Cory Aquino who took over the Presidency in 1986 illegally after establishing a revolutionary government after the late former President Ferdinand Marcos was taken by the United States government to Hawaii. At least back in the 1980s, the people were united in their delusion that they were working towards something good. That is not the case today. 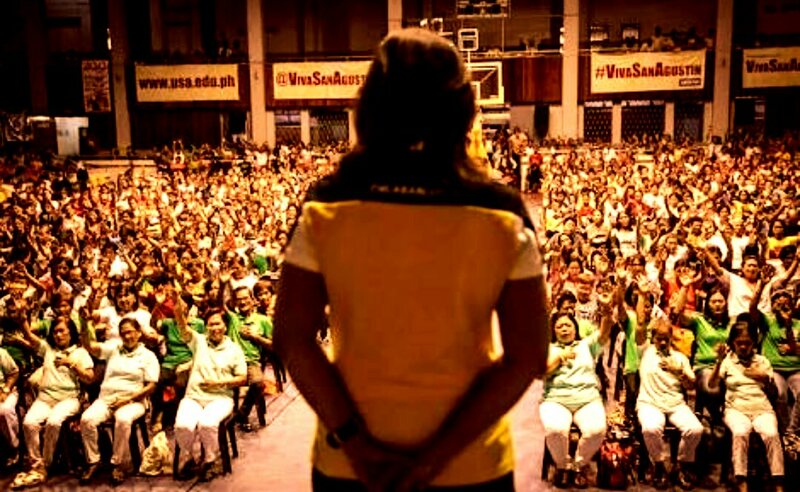 Today, more people will go up in arms against a Robredo government knowing that she neither has the vision nor the conviction to lead the country. Robredo would be more like a puppet of the oligarchy the way BS Aquino was during his term, but giddier, easier to flatter and fool around with. There is evidence that Robredo does what she’s told without thinking. Recently, her lawyer Romulo Macalintal told her she can immediately replace Duterte after the latter’s threat to declare a “revolutionary war” and suspend the writ of habeas corpus. Robredo then issued a statement saying she is ready to take over the Presidency as — if that is going to happen in a revolutionary government. She’s one of those people who would get arrested for her destabilizing efforts in a revolutionary government. To be honest, while it is tempting to just haul out all the people who are blocking the reform initiatives of the current government, it is a bad idea for Duterte to throw the rule book out the window. He must resist the temptation to commit the same mistakes as the Aquinos and stick to using the law in dealing with people who are doing everything including break the law just to oust him. After all, it there is one thing the yellow members of the Opposition are good at, it’s breaking the law by using short cuts. Overseeing an army of Yellow supporters requires being consistent with a narrative full of illegal ways of seizing power. Going back to Robredo, she is just not a good communicator. She is not very proficient in English and her Tagalog is terrible. She is not a good advocate for the language – a language that is only limited to Filipinos. She may not swear or have a foul like Duterte, but she is not a good alternative. She leaves a bad taste in the mouth. Next Article Will the Philippines become the next Hong Kong or Taiwan, Province of China? Leni is just another in the yellow “factory” of ” leaders” . Get name recognition via necropolitics and assume position regardless of mental deficiency and zero experience in crisis management. Then hype endlessly as the yellow hope and answer to all the problems of the Philippines. That recipe failed badly when it was copied by Mar Roxas and of course Leni required some pole vaulting or poll vaulting by one Andy Bautista who is currently also a deadbeat dad as well as a TNT who was caught with bribe money. Of course the yellows make the excuse he was family treasurer who I guess is exempt from SALN reporting. If we know anything about the yellows, the dumber the better. ONLY IN THE PHILIPPINES YOU CAN SEE A VICE PRESIDENT AND HER OFFICE USING HER ALLOCATED PUBLIC FUNDS TO CONSTANTLY BE THE ATTACK DOG OF THE OPPOSITION, ATTACKING HER SUPPOSED LEADER, THE PRESIDENT OF THE PHILIPPINES. Exactly right the yellows are putting the lives of pilipinos in danger. the president can declare martial law anytime the 87 constitution say. Leni Rob was not waiting for a bus; she stood there to be picked up by her boyfriend. It’s perfectly understandable that they’re the opposition to Duterte. They don’t have a plan for fighting drugs and corruption (and other major issues), which shows they’re not committing to good governance. But what should Pilipinos expect from those who never really tried. I realize Robredo isn’t slow. It’s just her reasoning and position on most matters are incredibly unjustifiable. Here is the thing. She is propped up to advance the yellow cause. She is not speaking for herself but as a yellow puppet. She is not finesse enough to handle it and make it even look or sound smooth. Caguioa , the other crook, is sitting on the results of the recount of the 2016 VP election. All Filipinos must be outrage on this hijacking of their will in the 2016 National election. It is election time…it is time to guard the sanctity of the ballots, and give these election hijackers, a dose of their own medicine…do not elect or vote any of their candidates. Time to remove this Fake Vice President, who is a nonsense and an imbecile…she tries to show up that she has brains, but she only appear foolish and show her head is empty ! Well what do expect from Leni Robber-do, este Robredo, from one Hepatitic statement to another Hepatitic statement. Definitely, she no feelings of remorse based on what she always says about the government. God forbid duterte dies and she’s installed… I’d give 2 months for the first coup to happen. 6 months before she gets assassinated. Leni the ceremonial VP. How does she feel when her only function there is to block BBM? She must have a lot at stake when she’s that impervious to criticism. >>She leaves a bad taste in the mouth. Ewan ko ba sa mga LP; halos lahat sila mukhang ewan na parang ewan magisip at magsalita. It’s like an virus that’s infected them all. Awkwardness seems to be the trademark of the Yellow Camp. Noynoy doesn’t even need a flesh-and-bone offspring to perpetuate his DNA. It just spreads out to those around him by naturally occurring osmosis. Cory at least was able to speak in straight English. Leni simply takes Yellowness to new lows. Congratulations LP on your straight downward path. The line will hit the x-axis this next poll season. Expedience is the following of blind impulse. It’s short-term gain. It’s narrow, and selfish. And that’s how Maria Leonor “Leni” Gerona vda. de Robredo says and thinks.